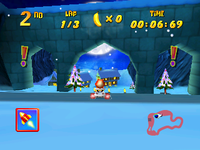 Frosty Village is the fourth and final track of Snowflake Mountain in Diddy Kong Racing and its Nintendo DS remake, Diddy Kong Racing DS. A minimum of 9 Golden Balloons are required for racing on the course, and 16 for the Silver Coin Challenge (Balloon Touch Challenge in the remake). 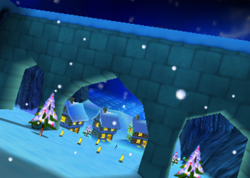 As its name suggests, Frosty Village takes place in a snowy village, as well as some cave segments. There is also freezing water that bounces racers upward. The track starts with a huge downward slope which may be totally skipped with the combination of a zipper and a blue balloon. After the first cave, if the player turns right they will find a shortcut with three zippers. After the second cave, one must be aware of the water, which only the hovercraft and/or plane may traverse over. In Diddy Kong Racing DS, several rock spikes were removed from the mid-part of the level. This makes the shortcut slightly easier to take. This page was last edited on December 18, 2018, at 21:18.